www.eupf.eu is an online resource guide for researchers, practitioners and students designed to facilitate the search for quality information sources regarding EU foreign policy. It endeavours to present them in a systematic and easily accessible way. Each theme and area of EU external relations is divided into several specific topics for which academic literature and official resources are available in the form of references or links to dedicated websites. The academic literature is evidently not exhaustive but contains major books and special issues of prominent journals dealing with EU foreign policy. The website also serves as a website companion to the book The Foreign Policy of the European Union by Stephan Keukeleire and Tom Delreux (Palgrave Macmillan 2014, 2nd ed). It offers further resources and reading for class work, papers and dissertations. The website is a joint project developed by the Department of EU International Relations and Diplomacy Studies at the College of Europe in Bruges, Belgium, and the Leuven International and European Studies (LINES) institute of the University of Leuven, Belgium. It has received funding from TOTAL in the framework of the TOTAL Chair of EU Foreign Policy at the Department of EU International Relations and Diplomacy Studies of the College of Europe and from the European Union as part of the ‘Jean Monnet Centre of Excellence on ‘The EU, Foreign Policy and Global Governance’ at the University of Leuven. 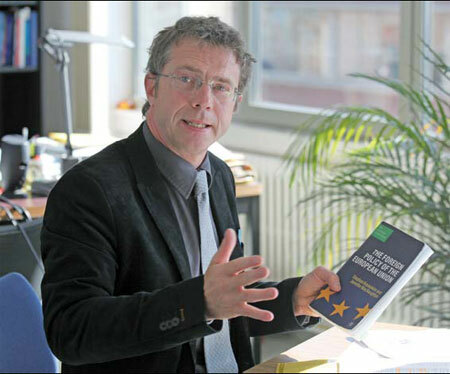 Professor Stephan Keukeleire has been the Chairholder of the TOTAL Chair of EU Foreign Policy (2011-2013) and currently teaches the course “The EU as a Foreign Policy Actor” in the Master of Arts in EU International Relations and Diplomacy Studies at the College of Europe. He is also Jean Monnet Professor in EU Foreign Policy at the University of Leuven and Director of the Master in European Studies: Transnational and Global Perspectives. Any questions, comments or requests for information can be addressed to info [at] eufp.eu.